"Plan B" Wins on PK's! "Plan B" is our latest Tuesday soccer champion, avenging a disappointing first round playoff exit last season. Despite a great regular season it wasn't an easy path to the title last night. First they took on last season's champion "Back That Pass Up", defeating them in a tight 2-1 game. 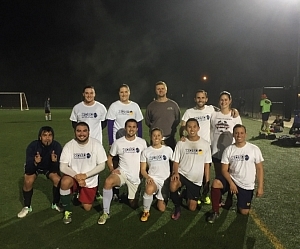 They followed that up with a thrilling game against "United" to decide the league champion, which ended with penalty kicks. Both games were close and hard-fought, but "Plan B" stuck it out with a tough defensive game plan. "Plan B" finished with an undefeated 8-0-2 record, looking nearly unstoppable. Their +21 goal differential was miles ahead of the competition, showing they were equally great on offense and defense. Their two ties on the season were against their two playoff opponents, but it seems like they learned a thing or two in those regular season games that they were able to use in their playoff victories. Congratulations to "Plan B" on a fantastic season, and we wish them the best of luck defending their title next season against some tough competition!